May I ask how she asked for the photo? For anyone defending Leigh Anne Tuohy, I want you to consider how absolutely mortifying this must be for those kids. Think about what it would be like to have some white woman come up and pepper you with questions about who and what you are while you’re just sitting there trying to mind your own damn business, and then think about what it would be like to wake up the next day to find your picture being used by a quasi-celebrity as some kind of race parable. Not only that, but in the picture you are being misrepresented – instead of a middle class kid trying to charge his phone, you’re a have-not case, taking charity bus fare to get to a basketball game. And now think about all the comments you get to read from racist white folks making assumptions about where you got your necklace from and why you were loitering in a KFC in the first place and you were probably just going to use that money to buy drugs like every other Black kid and look, honey, here’s a perfect example of what’s wrong with Black people today, they’re always hanging around wanting hand-outs. All of this because you dared to be Black in public. 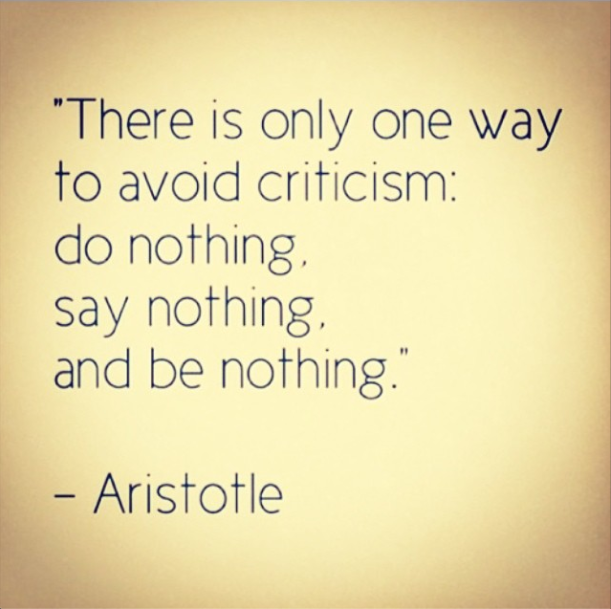 I’m not here to disagree with any great Greek philosophers or anything, but I’m willing to bet that even Aristotle would have a few words to say about the value of criticism. Criticism isn’t fun, but it’s what helps us grow and learn – it challenges us to change our perspective and be better people. I’m not saying that all criticism is valid, and of course it can be challenging to figure out how to separate the wheat from the chaff when it comes to people calling you out, but it’s incredibly vital that we learn how to do so. In this case, I would really encourage Leigh Anne Tuohy to take a hot second a listen to all of the Black people explaining why her actions and words have been hurtful. Because if your end goal is racial equality, then a good starting point is treating People of Colour as equals who deserve to be heard and not just objects in need of your gracious white help. The comments on both posts are full of people praising her – telling her how awesome she is, how open-minded, how kind. Reading these responses is completely baffling – like, did these people and I all read the same words? 1. Two teenagers were sitting alone and completely minding their own business. 2. A white woman decides that based on the fact that they are “huddled” in corner “nose to nose,” they must be “up to no good.” Because obviously whenever Black people (especially Black men) gather in public, it’s bad news for the rest of us! 3. Another white woman, one Leigh Anne “I Adopted A Black Boy So I Can’t Possibly Be Racist” Tuohy, decides that White Lady #1 is wrong. Which is actually the correct assumption for Ms. Tuohy to make, so I guess this is where some people are getting confused because we see that her intent is good, and that makes us want to believe that the action that follows will also be good. She’s at a crossroad here – two roads diverged, etc. Had she taken the road less travelled, Ms. Tuohy might have said to her friend, “Wow, you’re being really racist right now! I’m not comfortable with how this conversation is going.” Instead, she decided to confront the teenagers who, as a reminder, have done absolutely nothing wrong. 4. Leigh Anne Tuohy walks over to the two boys and sits there in silence. I’m sure that wasn’t scary for two Black teenagers at all, especially given recent events. 5. After what was certainly the most awkward ten seconds of those boys’ lives, Ms. Tuohy asks what’s “happening” at the table. Like, other than two teenagers sitting there talking like anyone sitting at a table might do? Some kids are hanging out and chatting. That is what’s happening. Unsure of the correct answer to this question – other than “we are two friends sitting together and not causing any trouble,” which probably seemed too obvious for them to point out – the boys remain silent. 6. Leigh Anne tells them that this is her store and they need to “spill.” Again, these kids have done nothing except be in public and be Black. 7. After being interrogated by this woman, and probably afraid that at the very least she’s about the call the cops, the boys show her their phones. This part just breaks my brain, like, these two kids had to show this woman evidence that they are doing exactly what they seem to be doing: sitting at a table and having a conversation. 8. 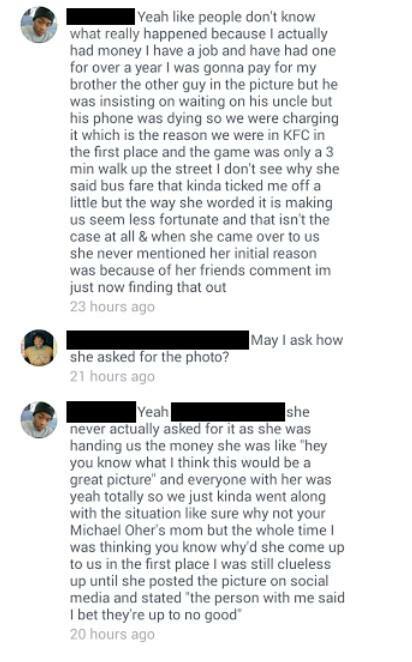 Apparently satisfied with the evidence the boys have presented her with, Leigh Anne Tuohy gives them bus fare and money for popcorn, but not before she has White Lady #1 take her picture with them. 9. Ms. Tuohy then posts this picture to social media and receives thousands of responses lauding her for being such a good person. Leigh Anne Tuohy profiled two Black kids, invaded their privacy and interrogated them, but somehow people are behaving as if this is some kind of wonderful social justice moment. No. Not even a little. This is some fucked up racial profiling combined with white saviourism, and it is racist as hell. Assuming that those kids were doing something bad was racist. Assuming that she could take up space at their table was racist. Insisting that they talk to her was disrespectful and racist. Wanting evidence that they weren’t up to no good was racist. Treating those boys as props to make her look good and then posting this picture publicly (and honestly, I wonder if the boys consented to that) is incredibly racist. Also, can we talk about how problematic using the phrase “don’t judge a book by its cover” is when it comes to talking about race? First of all, it begins with the assumption that the “cover” (or in this case, skin) tells you something unappealing about the contents of the book or person. It also implies that there is something unattractive or bad about the “cover” (or, again, skin). I can’t believe that I have to say this, but: there is nothing wrong or bad about Black skin. Black skin is not unpleasant or ugly, and to imply that dark skin might devalue someone is really, really fucked up. Black people aren’t things. They don’t exist just so that white people can make a point about themselves. These are two real kids who not only had to endure this woman’s microaggressions but have now had their image splashed all over social media – the Facebook picture alone has 150,000 likes and over 12,000 shares. Step away for a hot second from this white woman’s narrative, and think about how those teenagers must feel – having their privacy invaded, having assumptions made about them based on their race, and now having a white woman use their images to get praise for herself. Now tell me again about how Leigh Anne Tuohy did a good thing.